Kirby is back! How is the pink puffball’s first 3DS adventure? After a few years on the down low, Kirby and company make their original debut on the 3DS with Kirby: Triple Deluxe. Dating back to the series debut in 1992, Kirby games are best known for their whimsical aesthetic and simple gameplay. This remains true for Triple Deluxe. It’s a cute, harmless title that everyone of all ages can pick up and play very easily. Fortunately, Triple Deluxe is one of the most engaging experiences since Kirby Super Star for the SNES. 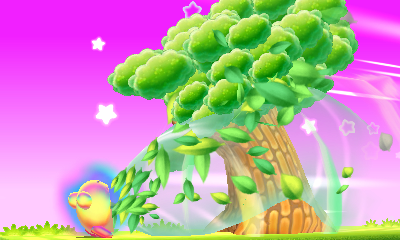 The game’s use of the 3DS’s gyroscopic sensor as well as the new abilities Kirby obtains throughout the game, make it a unique experience in spite of its occasional simplicity. This time around, Kirby just happens to get entangled into a beanstalk that ascends to the sky, where a mysterious figure kidnaps King Dedede. Although the game doesn’t have you exploring Dream Land like in previous titles, the game’s locales still feel quite familiar, with the first world boss being everyone’s favorite tree, Whispy Woods. Abilities are ever present as well. Choosing the right kind of ability is important, as throughout the game there will be challenges and puzzles that require specific abilities. This is kind of annoying at times, because sometimes the abilities you need can’t even be obtained through the stage. One of the major new additions is the Hypernova feature that appears in some stages. 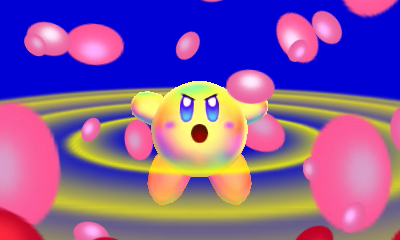 When Kirby interacts with the Hypernova fruit, he gains a rainbow hue and can inhale large amounts of items and parts of the stage that he previously would not be able to do. This adds a new, unique gameplay style that really livens up the experience. It’s nothing revolutionary, but when it pops up, it is rather fun to solve the puzzles that arise. Hypernova isn’t everything, though, and Triple Deluxe makes fabulous use of the 3DS system features, too. In some sections, you have to use the 3DS’ gyroscope features in order to progress. It’s also used to solve really clever puzzles throughout as well. The gyroscopic features also play a big part of some of the final areas in novel ways, too. In general, the 3DS gyroscope is a big feature of the game that is very impressive. While the story mode is the main attraction, Triple Deluxe features a multitude of other modes to complement it. Dedede’s Drum Dash wasn’t my thing, but if people enjoy rhythm-based games, carrying Dedede through rhythm stages based on Kirby songs would probably rock their world. 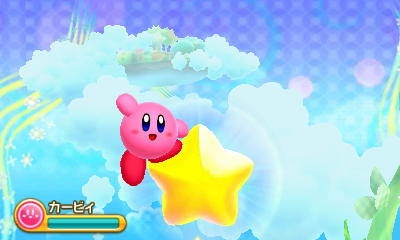 Kirby Fighters is fun to play, but relatively easy to beat quickly in the single-player mode. Unless you have friends around locally, Kirby Fighters is a short mode. The multiplayer aspect is fun, as it pits players against friends to duke it out with various Kirby abilities, but I wouldn’t say it’s something to play heavily. Once the game is beaten, players run through a boss rush as well an secret extra mode, but the modes beyond the main story aren’t particularly engaging. That doesn’t mean there’s not a whole lot to do once completing story mode, however. There are tons of keychains to collect throughout the game. The most common will appear as silver question marks throughout the game, but rarer ones can also be found that are gold. These keychains mostly comprise of Kirby abilities, bosses and other characters of interest throughout the Kirby series. They’re fun to collect and discover, adding replay value to story mode. Sun Stones are also equally important. Each level contains them in varying amounts, ranging from one one to four. The game requires you to collect them throughout the game not as simply just another thing to collect and do, but rather to progress. It is very annoying to backtrack and scour through a stage in order to find a obscurely hidden stone in order to continue the game. There are annoyances here and there, but Kirby: Triple Deluxe is still a strong entry in the Kirby franchise. It instantly feels familiar, but adds to the Kirby formula by adding a number of unique and interesting scenarios, through both abilities as well as the 3DS hardware. The learning curve is easy enough for any novice to pick up, and the charm and colorful graphics are easy on the eyes. It’s a wonderful platformer that is easy to recommend for anyone looking for a fun time on the 3DS. This review is a stark contrast to the people at IGN, not that I trust IGNorance that much but they're saying it's toddler easy to the point it's boring and insulting to your intelligence. I don't get that from this review but the tone that it's on par with what is expected of a classic Kirby platformer where it's easier than Mario but so sweet that it's just fun to relaxingly enjoy blowing your way through. I'm a mixed fan of the series hating on those with gimmicks (multi-kirby or off shoots) or junk controls (DS touch game) and the cases of annoyingly hidden overkill collecting stuff. Classic fun play the stages maybe find a hidden door on a few for bonus games style quality goodness and this seems like it fits the mold. I never got to a point where I didn't have enough Sun Stones to progress in the game, face a boss, or whatnot. I thought the Sun Stones were rather easy to find, save for a few that required holding on to powers for an extended period of time. I just started playing this last week. One thing I'd like to add to the review is how much more fleshed our some of the powers feel. More of them feel like they have full movesets than before, which is really nice. I've been enjoying trying out powers and seeing what improvements are there as much as trying out the new ones. And the Sunstones haven't bothered me yet. There's some that I missed because I went through the wrong door, but I agree with Phil: it doesn't seem to be a problem. Based on everything I've read about that game, that was a good decision. Hey! it was my first kirby game, and it was better then canvas (uhh!) curse!